Kids love observing the sights and sounds of the forest. Recently, while walking one evening through the woods, we saw a little owl sleeping in a specially made wooden house. At first glance it looked like a piece of wood sticking out of a hole, but upon closer inspection we quickly realized it was indeed an owl's head. It moved ever so slightly as we walked by, and we tried our best not to disturb it. My preschool daughter skipped all the way home giddy with delight and has since told every one she meets about the real owl she saw in the forest. Quiet Bunny , an adorable new picture book by Lisa McCue, beautifully depicts sounds of animals in the forest and, yes, it includes a particularly wise owl. Quiet Bunny is just that - a quiet bunny. He desperately wants to find his own voice so that he too can join the other forest animals in singing the night song. He tries imitating his forest friends, but fails. Finally, after following some wise advice from an owl, he discovers his very own bunny sound. The colorfully illustrated forest scenes include glorious sunsets and animals filling moon-lit nights with a sweet chorus of sounds. 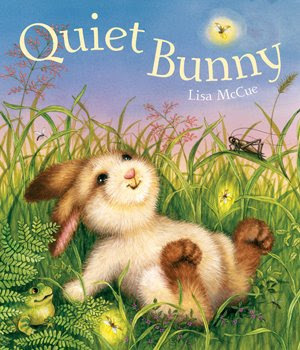 Quiet Bunny is the first book Lisa McCue has both written and illustrated. I've loved McCue's illustrations for quite some time. A very talented and prolific illustrator, her work can be found in over 175 children's books, including quite a few recent Corduroy titles. Indeed, Quiet Bunny immediately reminded me of a book I read once during a preschool library storytime called Bunny's Noisy Book by Margaret Wise Brown and illustrated by...no surprise here...Lisa McCue. Her detailed and cutesy illustrations of animals and nature will wow you, I guarantee. My favorite illustration is the one of Quiet Bunny relaxing on his back, making a wish by moon light. My daughter loves the last, wide, fold out page showing all the forest animals making sweet melodies together. The book may be of special use to speech therapists and early childhood development specialists. McCue is no stranger to speech difficulties; she personally has struggled with a lisp issue since childhood. She joined forces with a children’s speech language pathologist and developed Quiet Bunny as a tool to help children with speech-sound difficulties. My daughter especially enjoyed the interactive aspect, making all the animal sounds like "Croak" and "BzZzzz Zzzz" along with me. The book shares an important message as well. Remember that wise old owl? He encourages Quiet Bunny to "Be whooooo you are." The "be your self" message is one that should be shared with every child, every single day. Win a copy! Sterling Publishing has kindly offered to give away (5) copies of the hardcover book Quiet Bunny to Brimful Curiosities readers. 5 WINNERS! To enter, let me know what animal sound is your favorite (or your child's favorite) to imitate. • Contest ends on Sunday, May 10th, 2009 at 11:59 PM CST. My 20 month old loves to make a dog sound. He doesn't really open his mouth, so it is more like "bbbpp bbbppp" in a "woof woof" sort of rhythm. Before the dog fixation he did a pretty good elephant sound. I'm best at a cow's moo. My boys like to try to sound like monsters! My son likes to imitate a bear. I love the sounds of both a duck and a lamb. My boys like to make pig&cow noises it is really pretty funny! My 17 month old likes to say "moo" and "baah". My daughter likes to imitate a dog or a pig. O.W.L. ~ Owls. We heard some while in the mountains at night and boy oh boy if that sound didn't stick! Cats... My toddlers and I will mew all over the house.... They love that sound! My child loves to imitate the cow sound. We hear Moo quite a bit out of him. My son likes to pretend like he's a dog. His growl is funny. It more of a kee,kee type sound. Since we just adopted two new dogs, she barks like a dog all the time. My 2yr old son likes to make a "Woof" sound for a dog. Alison likes to howl like a wolf. She also barks and meows too. You never know what animal she is going to be when she wakes up. My 21 month old loves to bark like the dog does.Thanks! My 3 yr old daughter loves to pretend she is a roaring monster. And right now, my 1 yr old son is real into neighing like a horse. I love the sound of Cows mooing, especially baby calves. My favorite kid sound is when my niece is trying to Quack... no one does it quite like her. She just turned 2.. so much fun. She would love this bunny book. Thanks for the chance at the giveaway! I'm not very good at it, but I wish I could imitate lots of bird sounds. My son's favorite is a rooster. This sounds like a great book! This is a random one, but my son's favorite animal is the whale and he loves to make the sound of the air coming out of his blow hole--pshhhhhhhhhhhh!!! Thanks! My grandson likes to meow like a cat. My daughter loves to make the meow sound of a cat! For sure, Julien's favorite sound is a monkey & he's a darn good monkey too! My daughter loves to act/sound like a monkey! My son likes the sound that an owl makes. He also like to crow like a rooster! my little guy loves to quack like a duck. He is not able to make the sound, so its ends up just sounding like lip smacking. we love to ribbit like frogs right now cuz we just got a baby whites tree frog! I think that would be mooing and barking. :-) Thanks for the great giveaway! My daughter loves to "Moo" like a cow, she laughs everytime she does it! Thanks so much for such a great giveaway! Oink oink says the pig! The book looks so cute! Thank you! My daughter loves being a kitty cat! My daughter loves to make cow sounds. It's so funny to hear! Red-bellied woodpecker!!! Too fun, heh. My daughter likes growling dog sounds. My daughters favorite is a cow mooing and my son's is a lion roaring! Great giveaway! My daughter's favorite noise is the Meow of the kitty! I hear it all day long :) Thanks for the giveaway! I would love to win this book - my son has been in speech therapy since he was 2 1/2 - he is 4 1/2 now and has come a very long way. I just became a new follower of your blog also and signed up via Feed Demon. Has to be a cow's moo....followed closely my a monkey! My grandson's favorite animal sound is a sheep. We love making baby chick noises. The kids like cow sounds. Actually a cat meow is the favorite of my son but I think it's because we have cats and they drink milk so he meows for his glass of milk. I miss the sound of the whip-poor-will that I used to listen to and imitate as a child growing up. I wonder what happened to those birds. I would love to have this book for my grandson. Noah loves to imitate horses. I'm following with google reader. Thanks. i think a bird chirping is my favorite animal sound! My daughter liek to imitate a cow's MOooo!! Thanks for the giveaway. I make an awesome elephant trumpet sound. My son loves it! My daughter loves roaring like a lion! It's not loud or anything, but so cute! A dog barking or cats meow. The kids loving making all farm animal sounds. But, the one favorite is a cat meowing. Cat's meow! Even my cockatiel has learned to say Meow, as well as Here Kitty Kitty! Our cats love it! I am a new follower! I love your blog! Thanks for the giveaway. I'm wishing my reviews were as well-written and thought out as yours, lol.